For our February 2017 “Lost City” issue, we remember what time, disasters, and the wrecking ball have taken away. When Elias Kahn opened his first meat market on September 29, 1882, Cincinnati’s reputation as Porkopolis was beginning to fade: Prior to the Civil War, we were slaughtering more hogs than any Midwestern city, but two decades later, Chicago had become the country’s leading pork producer, and cities like St. Louis and Indianapolis were encroaching on the market, too. Yet in the face of competitive national and local markets, Kahn’s persevered. Elias died in 1900, but his four sons bought out competitors and grew the meatpacking business. During World War I, Kahn’s provided troops with 500,000 pounds of meat each month. In 1928, The E. Kahn’s Sons Company moved into a new facility on Spring Grove Avenue that could process and slaughter up to 3,000 head of cattle, sheep, and pigs a day. That Spring Grove Avenue plant operated for nearly eight decades—outlasting even the Kahn family—before being shut down in 2006. 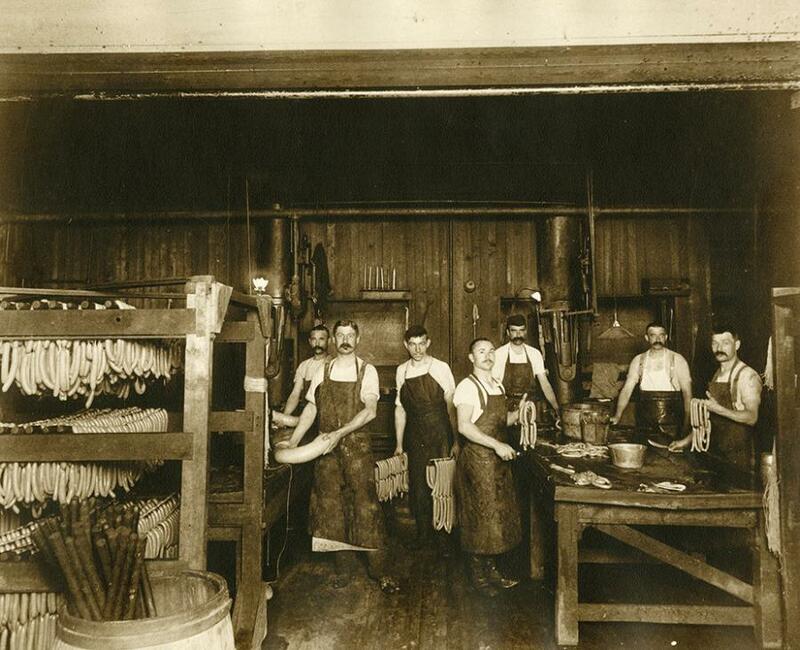 Making the sausage at Kahn’s, in an undated photo. Cincinnati Museum Center. Cincinnati History Library & Archives. General Photos. Kahn's Plant Interior and workers.